There are a few questions I constantly receive, and one of the most common is how to label artworks in an exhibition. The truth is, there is no single standard format, though most labels include the same key elements. I have written a previous post on the subject, How to Label Artwork in an Exhibition. Below, I have expanded on some of the specifics, as well included more examples of artwork labels. Depending on your preference, the title of the artwork can be plain, in italics, or bolded. Italics are often used to differentiate the title from the rest of the information, as well referencing english grammar rules for titles. The title could also be in bold as a different method of differentiating it from the remainder of the information. Generally, the date of an artwork is the year that it was completed. Sometimes, if a work has been continued over a long span of time and the artist would like to acknowledge that, multiple years can be included (for example, 2012-2014). If the date of the artwork is unknown (usually for historical works), “circa” is included: for example, c. 1919. The measurement of an artwork usually refers to the outer size of the canvas, paper, or other material that is the base of an artwork. Unless the frame is an integral part of the work itself, its measurements should not be considered the size of the artwork. The standard is to list the height, then the width. The depth, if applicable, would be listed third. For example, 57 x 46 x 3 inches. Sometimes, there is no specific dimensions for a work (for example, video work, or work which changes size depending on different installation circumstances). In the case of no specific dimensions, it is appropriate to list dimensions variable. For durational artworks such as video or audio, this format is often used to list their duration: 00:00:00 (hours, minutes, seconds). You can also simply list 1 hour, two minutes, or however long your work is. It is not absolutely necessary to list the duration of work, however works of this nature are often catalogued in this manner. This seems straightforward, although sometimes it can be difficult to decide what should be listed and what should be left out. It is really the artist’s choice how detailed they would like to be. For example, you can list your medium as simply as possible (for example, oil on linen). You can include more detail, if you feel it is integral to the work (for example, gel medium, tea, sand, dirt, grass on found canvas). Should you be selling your work and you would like to include a price on your label, place it at the bottom. If the work is not for sale, you can leave this area blank. If the work is loaned, this is where you would credit the lender. For example, Courtesy of Cleopatra. Museums or larger establishments showing artists of historical significance often list further information on their labels. This could be the birth year and death year of the artist (if applicable), the museum’s own cataloguing number for the work, and a credit to the donor of the work if applicable. The original post on this subject How to Label Artworks in an Exhibition includes tips and ideas for physically creating your labels. 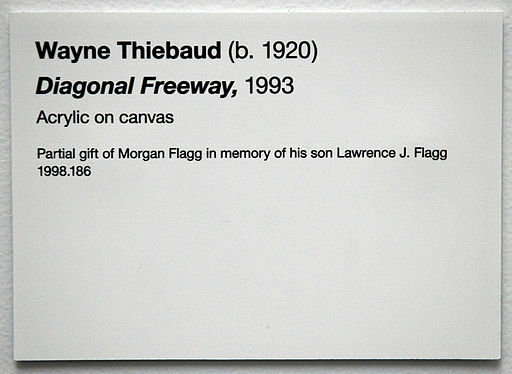 Whenever you visit galleries, take note of how they label their artwork. What do you think looks best? What do you find to be the most effective method for labelling artwork? I think that they used Helvetica or Arial. Those would be good ones. Please could you tell me where I can purchase the clear adhesive (printable) art lables? I’m not sure where you’re from, but probably almost any office supply store would carry them. One popular brand is “Avery” that we have here in Canada, and I assume they are available in the States too. We can help you with custom dry transfers. View our website at imagetransfers.com for more information. Johno — I find that 15 to 18 pt “Optima” is easy to read and looks professional. Hello! If the work is derivative (as in, using the work of someone else in or influenced by it) where should you include that in the label? I have photography students who are projecting other people’s photos over their subjects and shooting them. I’d like them to give credit to the original source, is that appropriate? Hi Kelly, it is probably most appropriate to inquire with the original artists and obtain their consent. if its a solo show do all the labels get the artists name? Reblogged this on Artually Living. I have this Painting with a Sticker bumper which reads AT THE LAKE AM SEE sur le lac.I have done searches online & could only find that my search comes up either Austrian,Swiss Germany.The artist Signature is hard to read,surname is very long,This is a white sticker label & white chalk numbers at the back.Its of two men in a boat one is standing & one sitting.they are fishing on the lake.Also there is a red bark roof & base shed is wood.I did come across a card of a row boat & it had the same inscription of the words on the label on the same as my painting.But I forgot the site I was in.Can you help me to track down the Company who made this label as I have tried looking but to no avail.Thankyou Sandy. Thank you for this Information!! I don´t want to be picky – in the beginning you stated the size of the work to be in 4th place (before technique) but in the example it is in the 5th place (after technique). Assume the position in the examples is correct? May I suggest custom dry transfers for smaller fonts? Vinyl usually cannot be cut in point sizes smaller than 18. Custom rub-down transfers can be done in almost any point size, almost any color and are very easy to apply. Our company, Image Transfers, can fill that need. Can you please help me with the material used for the placard? Is it foam board or acrylic or something else? And the letters are printed or embossed? A good post! Now all that is required is a good custom labels manufacturer. Deborah, We can help you with that. My company, imagetransfers.com, creates custom dry transfers that work perfectly on walls to customize your labels. Pricing is published right on our website. Would be happy to work with you. How would you label print editions? For example, postcards and posters made in collaboration with the artist and printed and published by and for Parkett? There often isn’t a title for the work, and it’s unclear whether to attribute it to the artist (as a proper artwork) or the publisher (who instigated the work). My best guess is that you title the work, in quotes, whatever text is on print material and list the publisher in the media line. I’ve seen a similar thing done for Ian Hamilton Finlay postcards where he collaborated with different typesetters, distributors, and artists for his postcards. David Hockney. “Issue 2,” 2010. Digital-print poster, published by Parkett. Courtesy of Parkett. what do you stick it to the wall with? Jesse, Our custom dry transfers are lacquer ink with lacquer adhesive.You just need to remove the backing sheet and burnish the type/copy to the wall. Once applied copy will look like it is printed right on the wall. Check out our website at imagetransfers.com for more info. I am a digital illustrator, who commonly creates renderings of well-known and, sometimes, not so well-known locations. Personally, I like to think of titles of my known, that emotionally reflects to this or that image, to write on the mat board, in addition to my name, prior to having it framed. Sometimes I would like to include the actual name of the location, IN ADDITION to the title. However, I am yet to think of a way to do this, that would efficiently and affectively portray the information, WITHOUT looking cluttered or out of the ordinary. My question to you is: is there any particular way of doing this? My guess is probably that there isn’t, but I would love to hear any advice you may have on the subject. Custom dry transfers may help you detail all the info you need and not have the exhibit look too cluttered. They are easy to apply and copy will look like it is printed right on the way. View our website at imagetransfers.com for more info. Thank you for posting this. Very useful indeed! What if the artwork is of, say, a landscape, and you want to identify its location but you have also have a title, that you emotionally feel influence’s the work’s meaning to the viewers’? I finally found your answer to my original question, posted awhile back, and it’s perfect! Thanks! Hi there,I read your new stuff named “Examples of Artwork Labels | The Practical Art World” like every week.Your story-telling style is witty, keep up the good work! And you can look our website about free proxy.